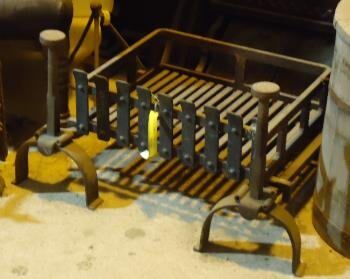 A reclaimed wrought iron fire basket, and dogs. 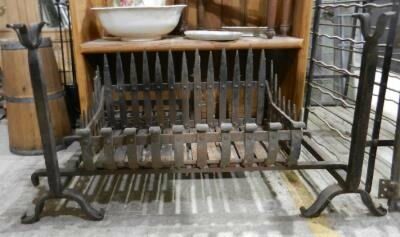 A large reclaimed wrought iron fire basket with rivets, almost certainly Black Smith made. 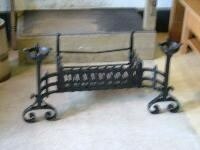 A wrought iron, reclaimed fire basket. 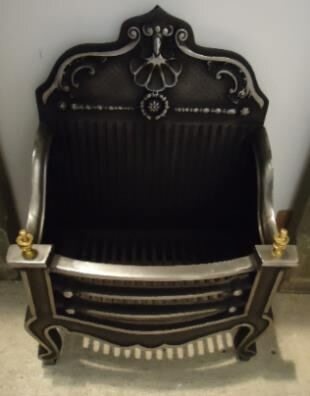 Height to top of legs : (432mm) 17"
Width across : (510mm) 20"
A reclaimed wrought iron fire basket, almost certainly Black Smith made and a pair of cast iron pinnacle dogs. 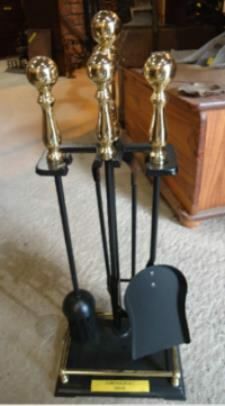 A companion set (brush/shovel/poker/tongs), with brass handles. 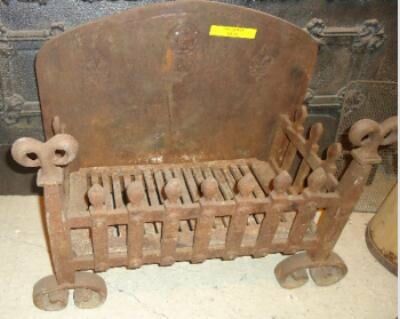 A reclaimed wrought iron fire basket, with back plate, and almost certainly Black Smith made. 610mm (24") height of the back plate. 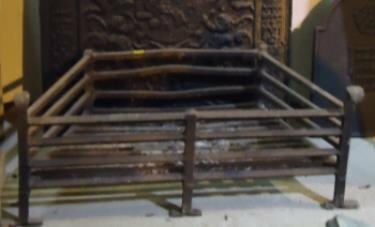 A wrought iron, reclaimed fire basket and dogs. 305mm (12") Height of basket from the ground. 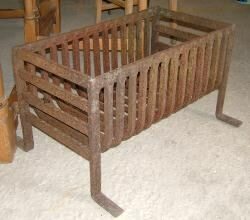 A reclaimed cast iron fire basket, with a pair of reclaimed French fire dogs. 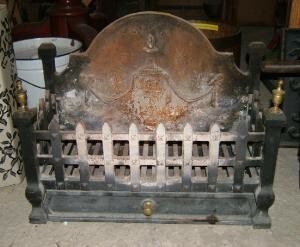 A reclaimed cast iron fire basket, with back plate. Slightly damaged back plate which has been repaired. 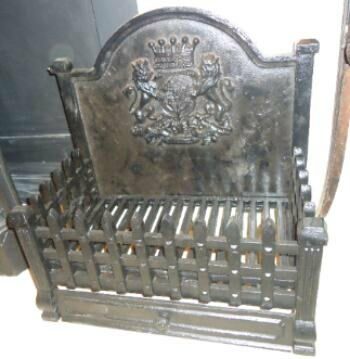 A cast iron fire basket, with a coat of arms back. 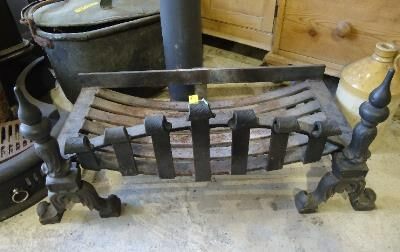 A reclaimed wrought iron firebasket. An old reclaimed, brass companion set . 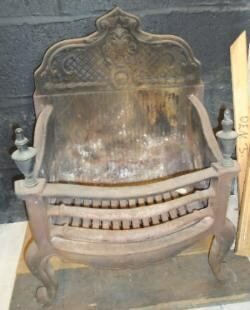 A reclaimed, very heavy, cast iron firebasket. 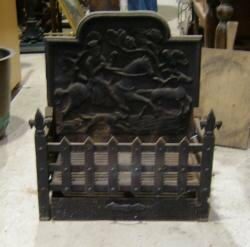 An old large reclaimed, very heavy, cast iron firebasket and dogs. An old reclaimed, gun metal companion set . 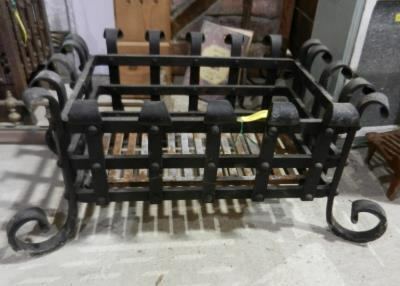 A cast iron fire basket . 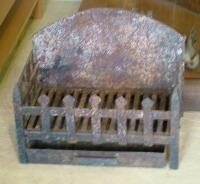 An old reclaimed, very heavy, cast iron firebasket. This has had a crack on the back plate, which has been repaired at some time. 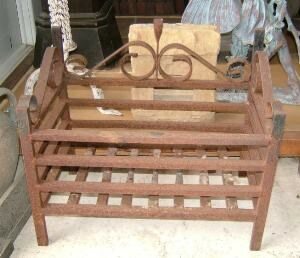 A reclaimed wrought iron fire basket . A reclaimed fire basket . 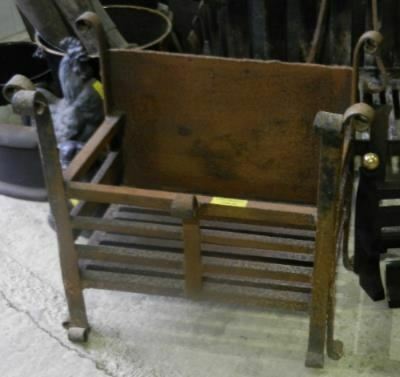 Description: A small reclaimed fire basket . 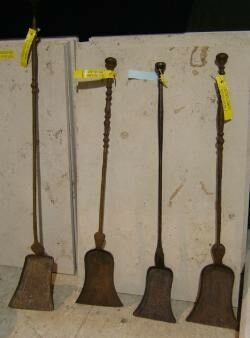 Description : Set of old reclaimed fire dogs. 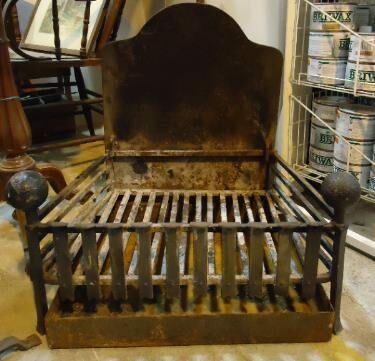 Description: A reclaimed fire basket with ash pan. 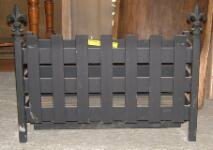 Description : Reclaimed small plain fire basket. Size: mm ( ") width x mm (") height x mm (") deep front to back. 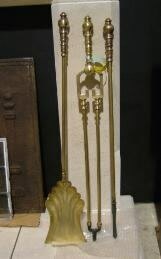 Description: A 3 piece reclaimed brass companion set with shell shaped shovel. 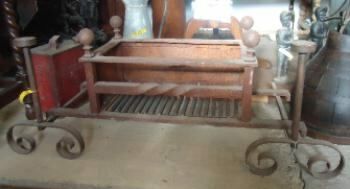 Description : Reclaimed fire dogs and basket, with ball and brass finials. Size: 610mm (24 ") width x 505mm (20") height to top of finials x 430mm (17") deep front to back. 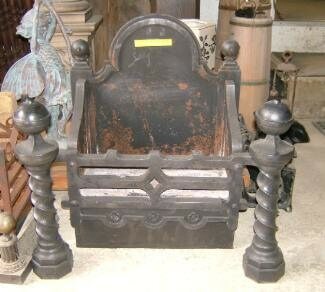 Description : An old reclaimed fire basket with brass finials. Size: 430mm (17") height to top of finials x312mm (12 1/2 ") depth from front to back x 505mm (20") width. 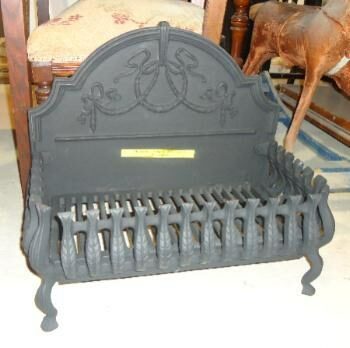 Description : A reclaimed cast iron fire basket, with brass finials. 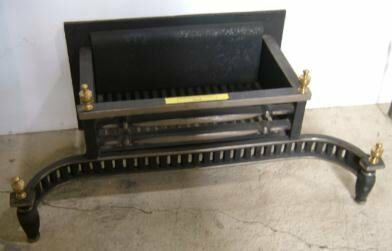 Size: 470mm (18 1/2 ") width x 456mm (18") height to top of back x 330mm (13") deep front to back. 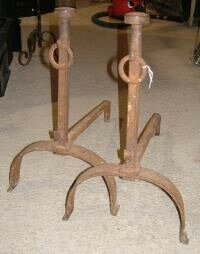 Description : A pair of reclaimed wrought iron fire dogs. Size: 432mm (17") high x 432mm (17") depth. Size: 332mm (17") deep x 458mm (18") high. 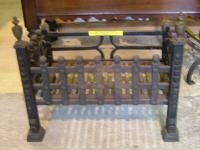 Description : A reclaimed Fire screen. Size: 940mm (37") (with out sides) wide x 610mm (25") high. 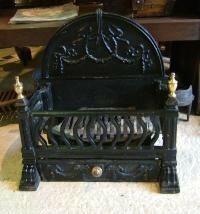 Description : A reclaimed wrought iron fire basket. With ash pan. Size: 510mm (20") wide x 330mm (13") deep x 405mm (16") high. 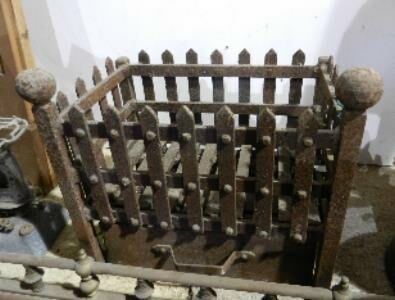 Description : A reclaimed old cast iron fire basket with small baskets on the top of the dogs. Size: 965mm (38") wide x 405mm (16") deep x 470mm (18 1/2") high. 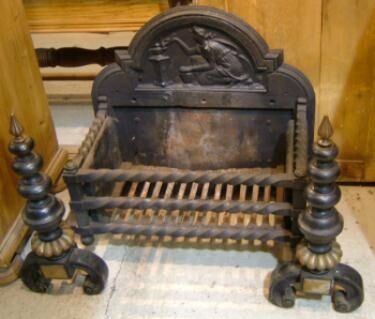 Description : A wrought iron fire basket. With ash pan. Size: 640mm (25.75") wide x 475mm (18.75) high x 230mm (9") deep. 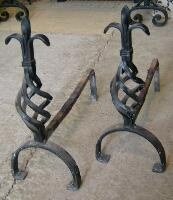 Description: A pair of wrought iron, French, fire dogs. Size: 470mm (18.25") long x 405mm (16") high at the front. 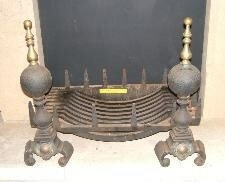 Description : An antique, set of, 3 solid brass fireside, companion set, on andirons. 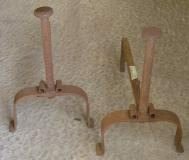 The andirons have a ball and claw design on the top of them. Size: 815mm (32") long x the height of the andirons 240mm (9.5). 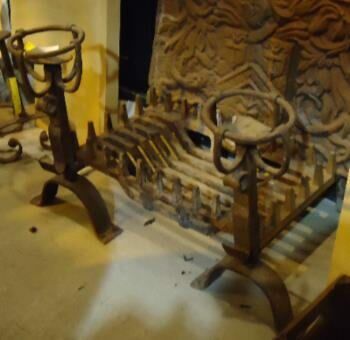 Description: A reclaimed pair of French, fire dogs with lion heads. Size: 255mm (14") long x 440mm (17.25") high. 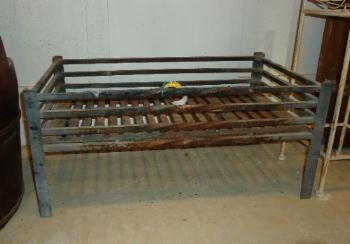 Description: A cast iron basket on pinnacle legs. Size: 450mm (17.75") wide x 295mm (11.5") deep x 230mm (9") high. 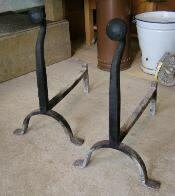 Description: A reclaimed pair of French, cast/wrought iron fire dogs. Size: 470mm (18.5") long x 440mm (17.5") high. 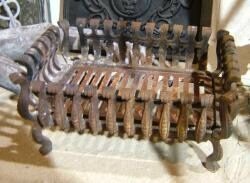 Description: A reclaimed small copper coal scuttle.. Size: 215mm (8.5") diameter x 280mm (11.5") high plus the handle. 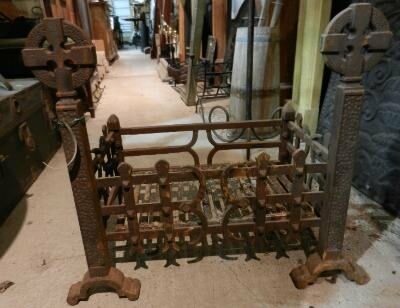 Description: A reclaimed metal fire screen with 2 folding sides. Size: 840mm (33") wide (open) x 570mm (22.5") high. 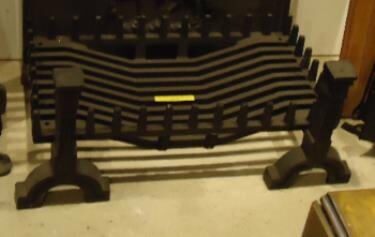 Description: A new cast iron fire basket on a pair of dogs. Size: 710mm (28") wide x 485mm (19") deep x 410mm (16") high.